Morning. A clean house. Neat. Tidy. Quiet. Febreeze. 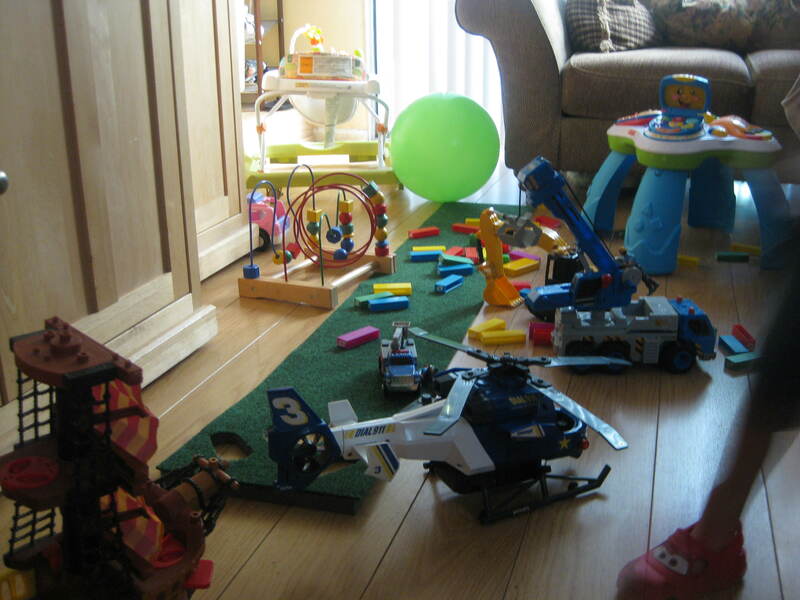 A motley crew of characters take over the living room like a crazy Toys R’ Us hurricane. Construction workers, pirates, Little People who constantly sing some “Open & Close” song that drives me nuts, Lightening McQueen and his race cars, Batman, Superman, and the Monster Truck entourage. This is followed by a quick game of putt-putt golf where we pretend we’re at The Master’s and apparently I lose quite often. The baby has no interest in following golf etiquette. She plays with the shapes toy from IKEA and an activity table with plenty of ABC and 123 songs. Too many if you ask me. Then we build a colorful structure with our Jenga blocks, which is then knocked down by the baby. Disappointment overcomes a four-year old boy until I build the tower up again. We play a fairly long game until the Jenga Powers That Be think I should lose for the third time in a row. The Big Green Ball makes an appearance, courtesy of the baby. Jenga blocks everywhere. Everywhere. Sneaky laughter. But despite the toy explosion my son in his Lightning McQueen shoes, and my daughter in her Old Navy socks, find space to dance once they hear Gangnam Style by Psy. It’s a rager. Moment of silence for mom … with chocolate. Great photo. It so perfectly captures the life of one busy, loving Mom! Is that a foot in a Lightening McQueen shoe frame right? HA! Yeah that’s my son. He’s got some Lightening McQueen clogs. He was jamming it to Psy’s Gangnam Style song and his foot happen to be in the picture while he was bustin’ his moves. He’s a big Cars fan. Not to mention that practically the entire country is going Gangnam Style. OH I know it’s everywhere. He was on Ellen the other day, but we just recently discovered him last week and it’s been one of the top tunes here along with One Direction and Eric Church. Odd combination, I know. My son likes all kinds of music. He’s a world music Little Man … works for me.